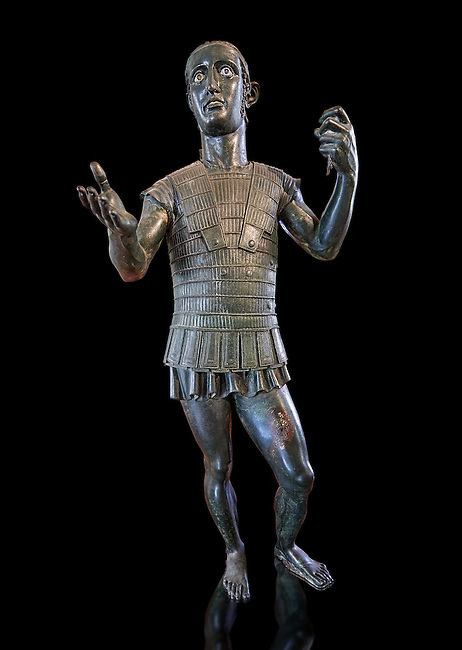 Etruscan bronze statue portraying a nearly life size young warrior dressed in armour, offering a libation of wine to a divinity ( patera style cup missing) Made in the 5th century BC in Orvieto and excavated from Todi where it had been buried after being struck by lightening, which was the custom at the time. Inv 13886, The Vatican Museums Rome. Black Background. For use in non editorial advertising apply to the Vatican Museums for a license.